Ryan: Liberated Deficit Hawk or Lame Duck Whose Quack Won’t Be Heard? 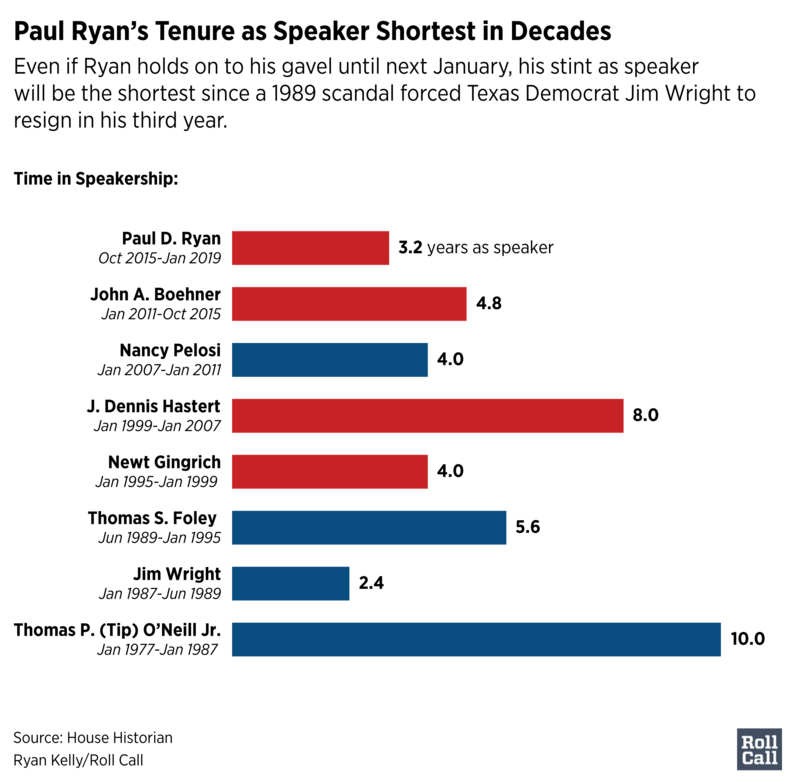 Paul D. Ryan is the first speaker of the House to depart on his own timetable in more than three decades. So what’s he going to do with the time he’s given himself for trying to massage his wounded legacy? His most obvious option is working to revive a pair of well-remembered but recently abandoned roles — earnest fiscal doomsayer in a time of coursing red ink, and steward of seriousness and stability in a Republican Party that’s in the thrall of President Donald Trump. During his congressional career Ryan has been the boyish disciple of supply-side economics, the passionate deficit hawk, the telegenic tax reformer, the creative visionary of a shrunken social safety net, the first Generation X nominee for national office, the reluctant vessel for the only-you-can-help-us pleadings of his fractured fellow House Republicans, and candidate Trump’s premier conservative scold. Throughout, he’s been the freshly scrubbed family guy who’d rather be bow-hunting and cheering the Packers back in Wisconsin than backroom-dealing and raising campaign cash in the Capitol. But after just 29 months at the pinnacle of congressional prominence, the central elements of his reputation have come to look diametrically different. He is the most powerful apologist and enabler of an embattled and unpopular president whose judgment and polarizing temperament he once openly abhorred, and who never seems to tire of poking and provoking his purported helpmates on the Hill. The two biggest achievements over which Ryan has presided in this Congress, a deep tax cut and a ballooning of discretionary spending, will swell the annual deficits he decries past $1 trillion starting in two years and nearly double the national debt to $33 trillion in a decade. And he’s working overtime on all the aspects of Hill leadership he clearly disdains — raising money, chiding wayward colleagues, settling their petty disputes and tamping down their own festering factionalism — in hope of limiting the damages his caucus suffers in the midterm elections to a garden-variety drubbing rather than a historic wipeout. All this, and he has never come close to finding a lasting bridge for the ideological schism inside the House Republican Conference that has bedeviled its leadership all this decade, between its majority of establishment conservatives inclined toward governance and its minority of hard-liners who routinely choose confrontation over collaboration. Ryan’s decision against seeking an 11th term while staying at the House’s helm until year’s end, announced Wednesday, holds the potential to launch a period of personal liberation and professional recalibration. He will be a lame duck for almost nine months, essentially one-quarter of his speakership, but for him that’s not going to be all that neutering because the window for important GOP policymaking has already closed at least through the election. But he’ll still be second in the line of presidential succession and the senior Republican in the legislative branch, with the power to summon a national megaphone to amplify whatever truths he might want to speak. And he will still be a few weeks shy of his 49th birthday when he leaves office, allowing him two full decades at least to make a return to public life. That’s an eternity in the electorate’s collective mind. So if Ryan still sees himself moving to the White House after his three teenage children are adults, there is plenty of time for refashioning how he hopes to be perceived by voters of the late 2020s or the 2030s. Ryan did not say anything at his Wednesday news conference to signal an immediate start to that process. The tone was totally different from the 2016 campaign, when Ryan worked to put plenty of distance between himself (and, by some extension, the House GOP) and Trump — disavowing many of the provocatively combative and boldly untrue things the candidate said, and cutting ties with the presidential campaign altogether a month before the election. After Trump’s upset victory, however, Ryan quickly concluded he was ready for a sort of Faustian bargain with Trump — holding his tongue no matter what the new president said, focusing instead on winning the president’s buy-in for a conservative legislative agenda, and hoping the arrangement promoted loyalty from GOP base voters and peace within the House GOP ranks. In addition, Ryan labeled as his signal accomplishments the two laws enacted this winter that were also identified, just this week by the Congressional Budget Office, as the biggest contributors to a rapidly worsening deficit picture: The tax code overhaul of December and the big increase in military spending (along with a comparable boost in domestic spending, which he didn’t mention) of March. Ryan did acknowledge, however, that he had fallen far short of achieving his most ambitious and politically risky goal: revamping Social Security, Medicare and Medicaid to curtail their pace of growth so they don’t absorb such an increasingly large share of annual budgets. They account for almost half of all federal spending today, a combined $1.9 trillion, and are collectively on course to mushroom more than 70 percent in just the next five years as the baby boomer generation keeps retiring. Since that’s not happening in 2018, then the most immediate task for Ryan — assuming he does not want to burn bridges among his colleagues — is to come off as a team player who’s not abandoning the House Republicans in an hour of peril but is doing whatever he can to keep his colleagues from drowning in a Democratic wave. The previous six speakers had their gavels taken away before they were ready: Jim Wright resigned under an ethical cloud in 1989; fellow Democrat Thomas S. Foley was defeated for re-election in 1994; Newt Gingrich quit to atone for his strategies backfiring on the GOP in 1998; Republican J. Dennis Hastert in 2006 and Democrat Nancy Pelosi in 2010 yielded power when their parties lost House control; and John A. Boehner gave up in 2015 in the face of a vote of no confidence from the hard-right Freedom Caucus. The last person to retire from Congress as the sitting speaker was Democrat Thomas P. “Tip” O’Neill Jr., but he’d wielded the gavel for a decade and was 75 when he gave up his Massachusetts seat in 1986. It was the second midterm of the Reagan era, and with modest input from the lame duck speaker, his party added six House seats.